The July 31st trading deadline was the focus of most of the attention at both the major league and minor league levels this week. That culminated for the Red Sox with the team acquiring starting pitcher Jake Peavy from the White Sox in exchange for exchange for shortstop Jose Iglesias, infielder Cleuluis Rondon and pitchers Francellis "Frank" Montas and Jeffrey "JB" Wendelken. SoxProspects.com Staff Writer James Dunne and Northeast Scout Ian Cundall analyzed the deal. It was no surprise that trade rumors seemed to focus on the top talent in the system, especially the top prospect, shortstop Xander Bogaerts (pictured). This is no surprise as he is not only the top ranked player in the Red Sox system, but the top ranked shortstop in all of the minors on all of the major mid-season rankings as the staff at Comcast Sportsnet points out. Sports Real Boston only furthers the hype around the potential star shortstop with a piece chronicling the developmental history of Bogaerts going back to his days in Aruba. Their conclusion is that Bogaerts could very well be the next Red Sox superstar. Comparisons for Bogaerts were aplenty too, with one article from WEEI.com intern and SoxProspects.com Staff Writer Tim Healey looking at similarities between him and Angels outfielder Mike Trout, and Brian MacPherson of the Providence Journal compares his potential impact to that of Orioles infielder Manny Machado. Finally, Jonathan Mayo at MLB.com writes that the trading of Iglesias clears a more direct path for Bogaerts with the possibility of him being called up later this season. Despite the majority of attention being paid to trade speculation, the rest of the system was busy and Northeast Scout Ian Cundall headed up to Portland and featured the Sea Dogs in his latest Scouting Scratch. 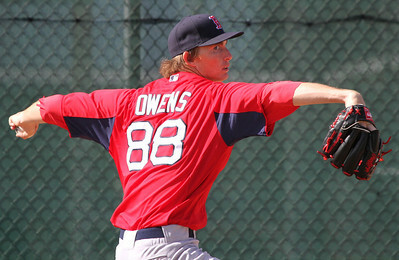 He was there just a bit too early, as later in the week lefthander Henry Owens (pictured) was promoted to Portland after 20 impressive starts for Salem as SoxProspects.com Staff Writer Luke Lavoie notes. Many prospects are starting to see time in the majors, among them was Brandon Workman who was impressive in his last start as Boston.com's Julian Benbow writes. In Scott Lauber of the Boston Herald's notebook he writes that after the Peavy deal infielder Brock Holt was recalled to fill that roster spot and Workman will likely be headed to the bullpen. Brian MacPherson of the Providence Journal writes about how he will join fellow converted starter Drake Britton who has impressed thus far as a reliever. Third basemen Garin Cecchini has been raking all season even after his promotion to Double-A and SoxProspects.com Staff Writer Tim Healey writes that it is the mental game that is making the difference. The news was not all positive at the upper levels of the system. Tim Britton of the Providence Journal writes that outfielder Bryce Brentz's knee injury may cost him the rest of the season. A little further down the system a couple young pitchers had milestone appearances. Jamie Callahan threw six perfect innings for Lowell as Alex Speier of WEEI.com writes, and also Red Sox 2013 first-round pick Trey Ball made his professional debut on Thursday. News-Press.com's David Dorsey writes about how both the Red Sox and Twins are handling their top selections very carefully, and Ryan Hannable of the Boston Metro finds out that Ball's best friend is now his former teammate and stepbrother. Some writers took broader looks at the Red Sox system as a whole, and one such piece from Tim Britton of the Providence Journal looked at the divisional rival Tampa Bay Rays and how they might be the best model for how to develop young pitchers. Photo Credit: Xander Bogaerts and Henry Owens by Kelly O'Connor. Will Woodward and Kevin Pereira are Staff Writers for SoxProspects.com. Follow them on Twitter @SPWill and @KevinPeriera.